As promised, the first installment of a photo album newly digitized (by me). My grandmother made this in 1947, when she was sixteen. It's her choice of snapshots about her life, taped into a loosely bound album of 28 black pages. Most of the photos are captioned on the reverse. For sharing I've photographed each page in its entirety, then each individual photo and its caption. I'll do about six pages a post (a couple are blank) for the next three posts (hopefully equating to the next three days--I'll try!). The album's creator is Nancy Gallagher, sometimes also captioned "Nan" (she captions herself in third person, for the ages). Her sister is Barbara. I don't know who any of the other named people are and unfortunately I never had the chance to ask. The family lived in St. Paul, Minnesota, though they also clearly took a trip to California at some point. 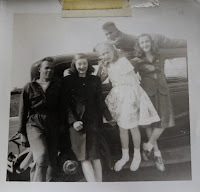 I love personal photo albums-- the way people structure the narrative of their lives is absolutely fascinating. I hope you think so too!